By 2020, Sarovar targets to achieve the 100-hotel portfolio. The company is also building assets by way of company-owned hotels and is also venturing into serviced apartments. Sarovar Hotels & Resorts, a pioneer in the mid-market hotel segment, operate Radisson, Park Plaza and Park Inn in India under a franchise agreement with Carlson Hotels Worldwide. Sarovar Hotels currently operate over 70 hotels in the country and apart from this, additional 15 hotels are at various stages of development. At a recent press conference in New Delhi, the hotel unveiled India's first 'Hindi' hotel website in view of company's growing presence across the country. The website was launched by Dr Lalit K Panwar, Honorable Secretary Tourism, Government of India. 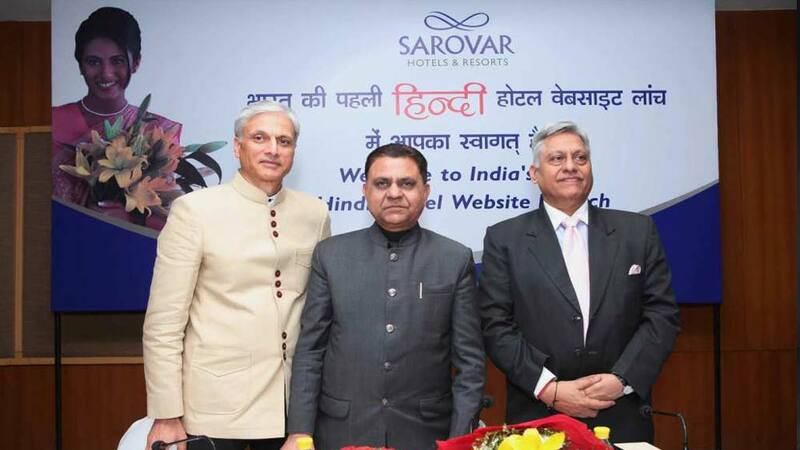 After unveiling country's first 'Hindi' hotel website, Dr Lalit K Panwar, Honorable Secretary Tourism, Government of India said, "I congratulate Sarovar Hotels for launching their website in Hindi. More than 180 million people in India regard 'Hindi' as their mother tongue and another 300 million use Hindi as a second language. So this is a fantastic initiative." The website is country's first fully developed 'Hindi' hotel website. Its USP is the website content, which has been crafted in 'everyday' Hindi to connect better with the target audience. The website is powered by US based Sabre Hospitality's leading 'Synxis' Central Reservations System that makes online booking effortless. Ajay K Bakaya, Executive Director, Sarovar Hotels & Resorts said, "I am proud that Sarovar Hotels is at the helm of such an initiative that connects us to our motherland even more. The Hindi website's launch is in line with our vision to be a truly Indian company, not only covering the country wide and far but by also connecting with our target audience in the Hindi heartland where business growth for our sector is today most promising." Sarovar Hotels has a diverse portfolio encompassing hotels, resorts, restaurants and corporate hospitality services. By 2020, Sarovar targets to achieve the 100-hotel portfolio. The company is also building assets by way of company-owned hotels and is also venturing into serviced apartments. Vatika to invest Rs 200 cr in healthcare..